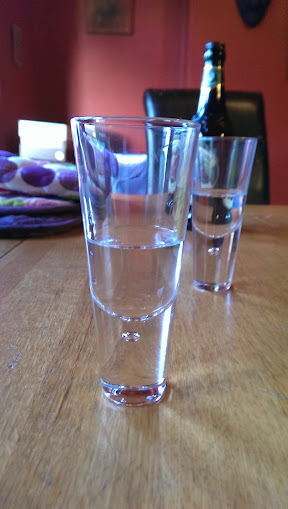 Cahaca is a Brazilian spirit made from fermented sugar cane juice. It is not quite the same as rum which is usually made from molasses a by product of sugar. Like rum and tequilla it has two forms a white young version, and an aged golden form. It has been on my to try list for years, and years mostly because it isn’t as easy to get hold of as rum or vodka. Your lucky to find one kind in a supermarket and i have never seen more than one brand. A quick trip to trusty Waitrose and we found a rather fine looking bottle. This cachaca is made by Velho Barreiro it claims to have been made since 1873 and is double filtered, it is the younger clear version. It is an clear spirit with a tinge, coming in at 39% ABV. The label reads Velho Barreiro is one of the most appreciated cachacas in Brazil, because of it’s delicate aromas, due to the very careful way of double distillation. We open the bottle, it has one of those strange dispensing tops under the lid, which appear to be designed to keep a Q from her drink. It takes me three goes to get it out of the bottle and into the glass. Smells of very slightly burnt sugar, no hint of rum white or otherwise, which since it is so often lumped in with rum i find surprising. Tastes very sweet, like a really rough drambubie, freshness at the beginning of the sip, almost grassy, swilling brings out hints of heather, and maybe a touch of lilac. There is an after taste I can’t quite name. It has fire on the way down and spreads warmth outwards. It is not possible to drink a lot of this neat, it grates after a couple of glasses. Reading the label suggests we mix it with coconut. As it happens Havana Club gold and kara is one of my most favourite drinks. 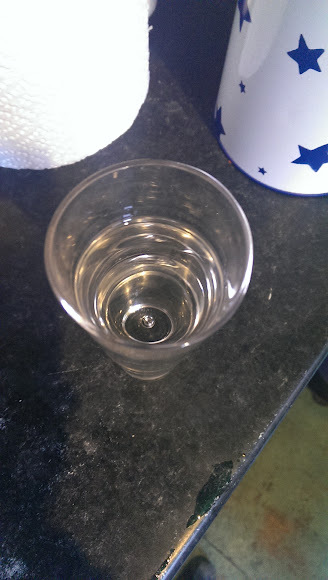 We mix a small glass each., take a gulp, gag and pour the rest down the sink (yes it was that bad). Luckily we had some cranberry in the cupboard so switch to mixing it with cranberry and soda. Still not great but we can at least drink it. I wouldn’t choose to drink this again, and having tried it have no idea how this could ever be confused with rum. I am still curious as to how ageing affects the liquor and will be on the lookout for the gold version. Having recovered recently from being ill, having as it turns out been ill for sometime, I am reacquainting myself with one of my loves alcohol. Each month I’m going to drink something new and write about here if I remember. This month the lucky Liquor is Jinro 25. 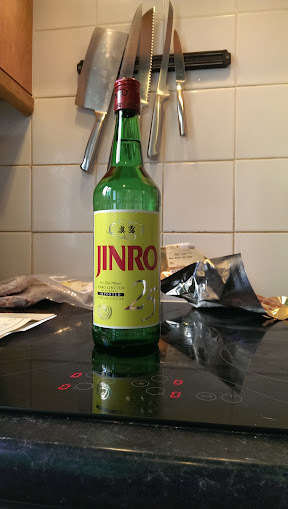 Jinro 25 claims to be the best selling Soju brand. What is Soju? A distilled beverage made and drunk across its native Korea. Wikipedia claims it to be ‘not unlike vodka’ in which case we will get on famously. Traditionally it is rice based, though modern manufacturing processes see the addition of sweet potato, potato wheat, barley and tapioca. It can range from 16%-45% ABV. Soju apparently means ‘burned liquor’ and it has been distilled since the 13th century. We opted for drinking this neat. Very slight tinge of colour to the liquid. Smells a bit like vodka, in particular bison grass vodka. It is smooth, not so sure about the silky bit. Sweetness is present, but you miss it if you knock it back. Rolling the liquid round your mouth brings it out along with some other flavours. Though it is not a caramel type of sweetness, more a tongue on a spoon of sugar. Doesn’t have the warmth/burn of other spirits. Soju drunkenness creeps up on you. There are two of us making our way through the bottle, one of us drinks a third to a half more than the other. Drunk arrived when there is about 200ml left in the bottle. At bottle empty we are eating crisps (and as I discovered a few days later, putting crisps on the cats back). The drunk is mellow with a eucalyptus behind the eyes feeling, which is most bizarre. There is a definite lightness in the eyes. Like a breeze. But no energy in the body it is a bit like being stoned, the mind is strong but the body is weak. The after effects suggest it is not as clean a spirit as vodka nor as agreeable as rum. Bit of headache, couldn’t face any other spirits the next night, but a couple of bottles of wine went down a treat. Overall it was an interesting experience but not one we will be repeating again in a hurry. Maybe if we can find an all rice Soju we would give that a go, being as we are fans of Sake, Jinro 25 though is a no. 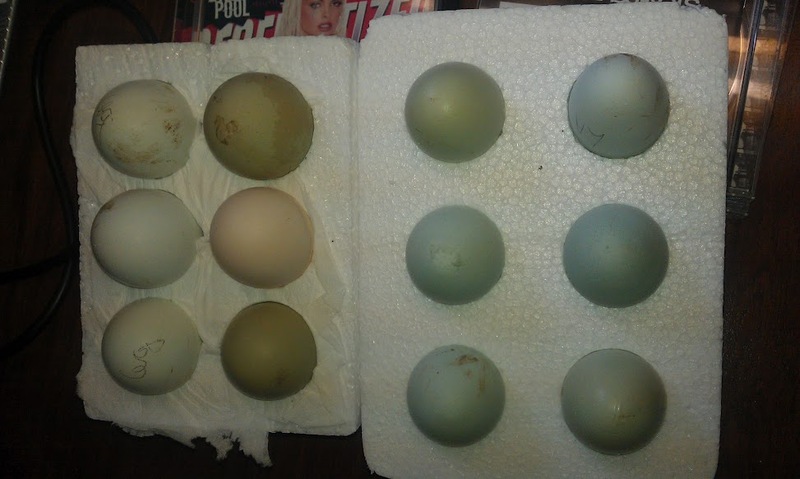 Time to start thinking about hatching. I say thinking the first batch of quail eggs are on route. I had hoped to have a new more controllable incubator but for now will have to make do with my old trusty blue one. There will be chicken chicks as soon as the hatching eggs become available, still not decided on what breeds to try this year. We are also currently thinking about flocks and housing and how we are going to run them. Ideally we would have two flocks so we have eggs all year round, each year. An aviary is also on the list for the Quail, and would mean i could have some flying birds too. Mix everything together until smooth, I use a machine though you can do it with a spoon. 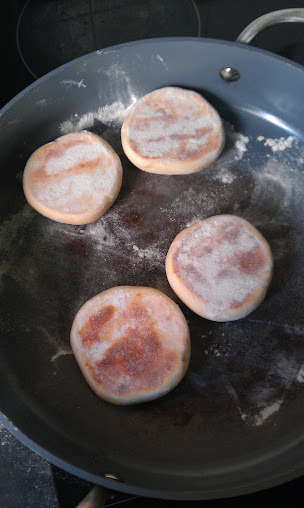 Scatter rice flour on a baking tray. 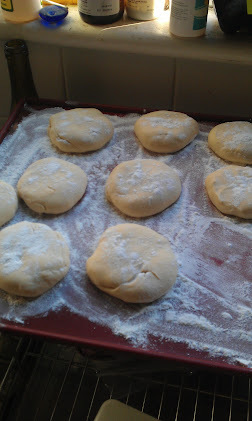 When dough looks smooth, break of a small bit of dough and using rice flour to stop it sticking, shape it into a round flat disc shape and place on tray. I get 10-12 muffins from this much dough. Cover tray with a tea towel and leave to rise for twenty minutes. Meanwhile heat a heavy bottom frying pan or griddle. 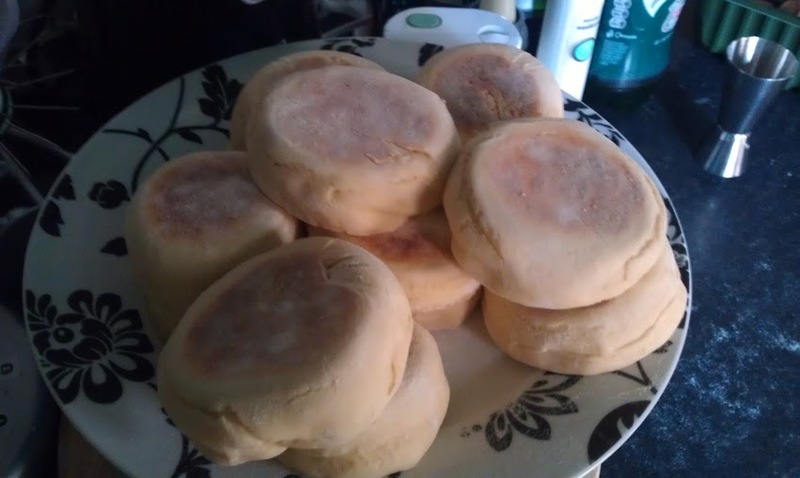 After twenty minutes using a fish slice transfer three or four muffins to the hot pan. Cook for a few minutes and flip over, and cook on the other side. Okay maybe not, but they are very pretty looking. These went into the incubator last week and will be day seven (candling day) tomorrow. Lurgy seems to have struck our family once more. 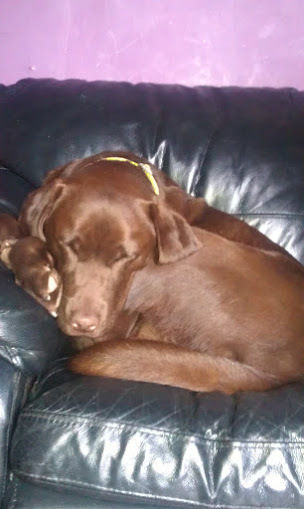 Even the dog has a dribbly nose. The rest of us either have hacking coughs and luminous green snot (the grubs) or heads full of gunk, pain and ears that no longer function. We are now down to 25 Quail. They went outside in their new abode at the weekend and we split them into two groups, the once that were biggest and even in one, and the smaller ones in another pen. Within a couple of days many of the smaller ones had caught up to the size of the bigger ones. They grow so fast. This little chap didn’t make it though. The man and I (as well as our next door neighbour) had been looking at him for a couple days and trying to decide what to do, since he is clearly not right. Yesterday when feeding them i discovered nature had taken its course and little chap was dead. In chicken news five of the kids went to their new home on Saturday and are settling in well. You can really see the difference in the faster growing commercial breeds compared with the slow growing pure breeds now. They are nearly twice the size! We have taken advantage of the weather today and mostly been outside. Everyone is tired now. The grubs, the puppy, and even the chickens who got to have a practice at being proper free rangers. They are now all lying on the floor of their coop looking worn out. Harry is definitely trying to go broody. I caught her in the nest box half a dozen times today. Once pecking at an RIR and once sitting on two other RIR’s while they tried to lay. She then went and stood by the run of the kids fluffing her feathers up and trying to beck peck them (the brahmas got a bit scared and stayed in the coop – must take some pictures of these guys the boy brahma is so gangly and they are so lovely) the older kids just pecked back at her till she flounced off on disgust at the youth of today. 100 flowers potted up into tubs, platers and baskets. Shallots, beetroot, chinese raddish, more salad, globe raddish, chantaney carrots, and purple dwarf beans in. Chelsea buns made and devoured, and i’ve put my name on the waiting list for an allotment.